Customize your package to the United States Grand Prix at the Circuit of the Americas in Austin, Texas. These packages include hotel accommodations in Austin, tickets to US Grand Prix weekend, track transportation, track tours, hospitality options, and more. Since 1908 the US Grand Prix (formerly the American Grand Prize) has been the premiere motor race of the United States. The race itself has run across ten locations and has settled at the Circuit of the Americas in Austin, Texas. The high octane race in the capital of Texas features 56 laps across a circuit created to mimic some of Europe’s most prestigious circuits. Historically the US Grand Prix has been dominated by British drivers including greats such as Graham Hill, Jim Clark, and Lewis Hamilton. Most recently however German born racer Michael Schumacher has dominated the track and has taken five victories on the circuit from 2000 to 2006. The winner of the 2014 US Grand Prix at COTA was British born driver Lewis Hamilton. Anyone looking to visit to the Circuit of the Americas is recommended to take in some of the numerous features of the track including a 251 foot observation tower that allows for a full 360-degree panorama view of the circuit. As well, the track’s main grandstand, that can seat approximately 9,000 spectators, measures in at an impressive 65 feet tall. There are few areas within the circuit that offer anything other than a stunning view of the track. Another unique feature of the circuit is a built in amphitheatre at the base of the circuit’s observation tower. The Austin360 Amphitheatre can seat up to 14,000 visitors for major concerts and events hosted on-site. Notable performers at the Austing360 Amphitheatre include KISS and Kenny Chesney, who hosted the inaugural performance at the venue in 2013. 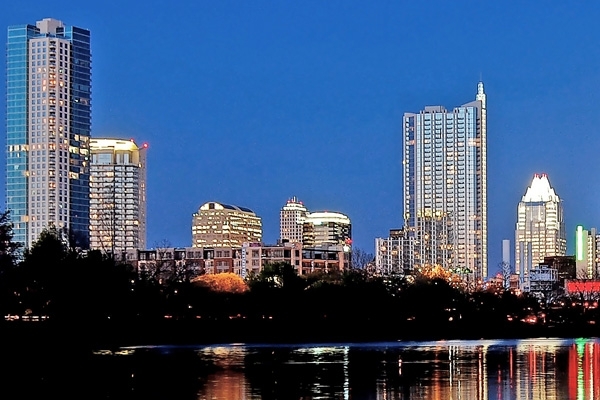 When in Austin, Texas there is plenty of sights and local fair to take in during your trip. The city of Austin is known as “The Best Golf City in America” and for good reason, the city holds over a dozen famed golf clubs for you to book local tee times on during your visit. Local nightlife in Austin is sprawling with country music bars including The Broken Spoke and The Continental Club. Both venues have featured performances from some of the most famous musicians in country including Stevie Ray Vaughn, Willie Nelson, and George Strait. Be sure to visit one of these fine establishments for a night full of Texas Line Dancing. When visiting it is essential to do some local shopping within the city. The best destinations to do just that are located in the Second Street District, home to some of the best corporate and independent designers in fashion. Take home some pieces of handmade Texas attire to remember your trip by.